Ian Quayle started playing bluegrass five string banjo nearly fifty years ago and played in several bands in the Cambridge area during the late 60s/early 70s. His band played at the Cambridge Folk Festival several years and also accompanied American bluegrass legend Bill Clifton on one of his visits to the Festival. He and his wife moved to Herefordshire ten years ago, on his retirement, and he started teaching shortly afterwards. He played regularly with Herefordshire bluegrass band Pickin’ in the Kitchen, until they disbanded last year. Ian explains that “the banjo” covers several related instruments, including, for example, the four string banjo used in traditional jazz bands and the tenor banjo predominantly used by Irish musicians. Ian plays the traditional American five string banjo, which is the direct descendant of instruments brought to American by early slaves. The bluegrass style of playing that Ian excels in, was developed in the 1940s by the late Earl Scruggs and is familiar to many people through film and early television in such shows as The Beverley Hillbillies and the films Bonnie & Clyde and Deliverance (dueling banjos). 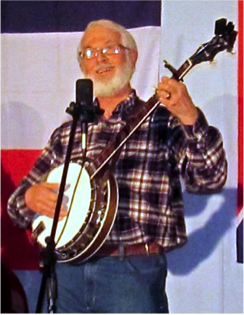 Ian’s bluegrass banjo lessons are primarily for beginners and are based around a recommended book by Janet Davies. They are intended to be both fun and achieve quick results. As more techniques are acquired, these are fitted into new and already-learned pieces so that they eventually become automatic. Ian normally teaches at his home in Fownhope, but is also happy to travel to his student’s own home.